The election of Padma Kuppa Tadepalli as the first Indian-American woman in Michigan state did not make the national headlines. But it was a significant moment nevertheless. 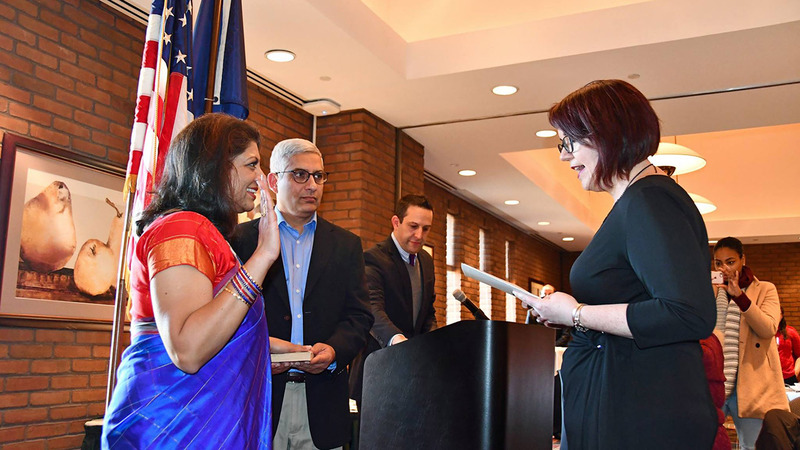 Last month on 5th January, dressed in a bright red-and-blue sari and swearing on the Bhagavad Gita, Ms Kuppa was confirmed to the Michigan House of Representatives for District 41. She is also the first Indian immigrant and Hindu elected to the Michigan legislature. She wasn't alone of course. Across the U.S., a number of South Asians were newly elected to national or state offices (a full list is at the end) in a wave election for the Democrats. And since Democrats are more likely to pick a diverse range of candidates, South Asians benefited from Trump's unpopularity. In Kentucky, Nima Kulkarni became the first state representative of Indian heritage; Josh Kaul was the first Hindu American to be elected State Attorney General in Wisconsin; Mujtaba Mohammed and Kevin Thomas became the first state senators of South Asian heritage in North Carolina and New York respectively. But there's something more notable about Ms Kuppa's election in Michigan. She is from the Telugu-speaking community which hail from southern India. Telugu is now the fastest growing language in the United States, according to the Center for Immigration Studies. The number of U.S. residents speaking Telugu jumped by 86% between 2010 and 2017, mostly due to immigration into tech and engineering professions from south India. Both the CEOs of Microsoft (Satya Nadella) and Adobe (Shantanu Narayen) are from Hyderabad, the capital of Telangana, and speak Telugu. Telugu is also the most commonly spoken language after English in the city of Troy, which Padma Kuppa now represents. Around 12% of students in Troy hear Telugu at home. Barfi Culture asked Ms Kuppa about her campaign in an email interview. She said while there was lots of excitement and support from the local Telugu community, her support was broader than that. "Volunteers came from across the South Asian community, canvassed their neighborhoods, made phone calls and several had fundraisers. A group of inspiring Telugu women from the Metro-Detroit area (Anita Yalamanchi, Anu Kosaraju, Kavita Ponduri and Sridevi Reddy), organized an event 'Women Coming Together for Women,' successfully providing both financial support and engaging a community of women whose stories are also my story." She also said political campaigning was helping strengthen the Indian-American identity. "The energy that people from the Indian immigrant community poured into the campaign shows how we can fully embrace our identity as Americans, take a seat at the table and have a voice advocating our specific concerns, and help to create a reflective, representative democracy." Ms Padma Kuppa came to the US from India at the age of four. She went back to India as a teenager and studied there until she got a bachelors degree in mechanical engineering. Then she moved back to the US permanently and got involved in politics after a career in other industries. She told Barfi Culture: "Being bilingual has taught me that there are words and phrases from one language that require effort to translate into another. Similarly, we have perspectives that require effort to parlay to someone from another background, be it diversity of age, gender, ethnicity." Is there any India-specific legislation she plans to take up? Ms Padma Kuppa told us that Indian Americans had the same concerns as other Americans. "I am focused on state-level issues, which will have an impact on all Michiganders - including Indian Americans and Telugus in the state and my district." But there were some federal-level issues, such as the green card backlog, that affected her constituents and would raise she said. "I am waiting to see what Policy Committees I will be assigned, decide which Legislative Caucuses I will join, and generally learning the ropes of what it means to be a good State Legislator and an assistant Democratic whip." » Telugu is currently the fastest growing language in America. » It is native to Andhra Pradesh and Telangana states in India. » Most Telugu speakers moved to the US to work in tech or engineering. » In 2015, more student visas were issued in Hyderabad (capital of Telengana) than anywhere else in India. » One in five Americans don't speak English at home.